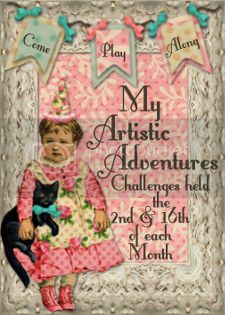 I've been following the blog of Jamee at anewkindofnormal.com for a little while now. What a remarkable endo-sister! This year she has organized a Blogging for Endometriosis Awareness 2013 Challenge. 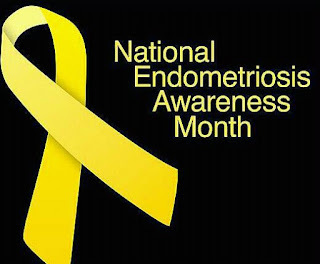 I think it is a great way to create awareness, and it has motivated me to finally post about Endometriosis on my blog. For this week, week 1 of the challenge, we are asked to talk about the physical impact that endometriosis has had on our (my) life. And wow! has it had a long term impact on my life. For most of it. For the past 30+ years. You see, my pain started when I first got my period... at age 10. The pain was so bad, I remember curling up in fetal position most of the time for a week every month, with the worst migranes that kept me from school, summer camps and just enjoying my childhood and teenage years. The saddest part was that all the important females in my life kept telling me that it was "normal". That "that time of the month" was painful. Only now I realize, that they all had endometriosis as well! At 19 I joined the Army. Yep, you didn't know that about me, huh? I am an Army Veteran as well. Can you imagine doing "PT" during that time of the month? Not pretty. Very painful. By then, it had also affected my stomach and intestines, and I developed what we now know to be Irritable Bowel Syndrome (IBS). Running was painful, but the worst was the crunches. Oh, I remember how the pain shot down my legs and my knees when it was time to do crunches. It was so bad, that by the time I got to Korea, I was always on sick call. I was finally diagnosed at age 22, when an Army doctor did my first laparoscopy. I was stationed in Fort Huachuca, Arizona. Endometriosis sounded like something horrible, and I thought I was going to die from it. I had 3 surgeries in 2 years, and by then, I was feeling tired, with constant back pain and stomach problems, that I decided to just leave the Army and become a civilian. I felt that they thought I was making it up, which kept me from achieving more than I did while in the service. To make matters worse, I couldn't get pregnant. I had been married for almost 6 years and no baby in sight. Infertility was not an option back then - it was a new thing - and anyway, intimacy had become a major burden for me, as it was so painful I had to take painkillers just to get through it. This of course caused major strain in my marriage, and coupled with other things, we ended up getting divorced. At the end of the year 2000, when I was 30, I was started on Lupron. Although the side effects were brutal on me, I think it did helped control my Endometriosis in the end. I remember how my joints and my bones hurt so much for all of the treatment, that I felt I was made of glass. No one could even hug me, as it was so painful. My hair fell out, my skin dried, I gained 50 lbs... and I was in an emotional rollercoaster. Crying one minute, and laughig hysterically the next, It cost me my job, a relationship and some friends. The Lupron treatment was such a milestone, I used it to measure a lot of things in my life for a while after that - if I had survived Lupron, I could survive anything. A while after that I co-founded Endometriosis de Puerto Rico y el Caribe, along with some very good friends I have made along the way. We are all patients who provide support to other Endo-sisters. We have a group of doctors who provide education and support as well. We are a great bunch! Ironically, Endometriosis saved my life. In the Spring of 2008, I was not feeling well. Those symptoms we always know are endo related... you know the ones. I was feeling tired all the time, with horrible back ache, my IBS was out of control, and I just KNEW it was Endometriosis. I begged and begged my GYN to do another lap for months and make me feel better again. After having 7 laparoscopies (different doctors), he felt he did not want to do another one for fear of adherences. So, he sent me to have a CT scan - abdominal and pelvis - only to find that I had an 8 cm tumor on my right kidney. Yes. Endometriosis helped discover I had Kidney Cancer. So for the past 3 and some months years, Endometriosis had been the furthest from my mind. The back ache continued, but I learned to live with it as I regained my strenght after loosing a kidney. On a routine checkup, my Oncologist discovers I had "something" in my breast. I was diagnosed with Atypical Ductal Hyperplasia in October 2011. The culprit? Estrogen. The same estrogen that fueled my Endometriosis. The same estrogen that fed my Endometriosis and kept me from having any children. On May 2012, I had a full hysterectomy with both ovaries removed. And guess what? My back pain is gone! And for the first time in my life I can say I am pain free. I am 41 years old, I am in full menopause, I WAS an Endometriosis patient, and I have never been more happy, healthy and pain free in my life. My cancer is in remision, no other breast nodules have been found, and I continue to support and fight for my endo-sisters, through our website, our Facebook page, our Facebook group, and with the help and support of many organizations. I may not have Endometriosis any more, but I will always be an Endo-Warrior. Please share your story with me. And help me spread the word: Endometriosis Hurts! What an amazing story! You are one strong lady! I am so glad to read you that beat your cancer and that the hysterectomy has helped you get rid of the pain! Thank you for sharing your story and continuing to fight to help raise awareness for endo! I look forward to reading more of your posts throughout the month!